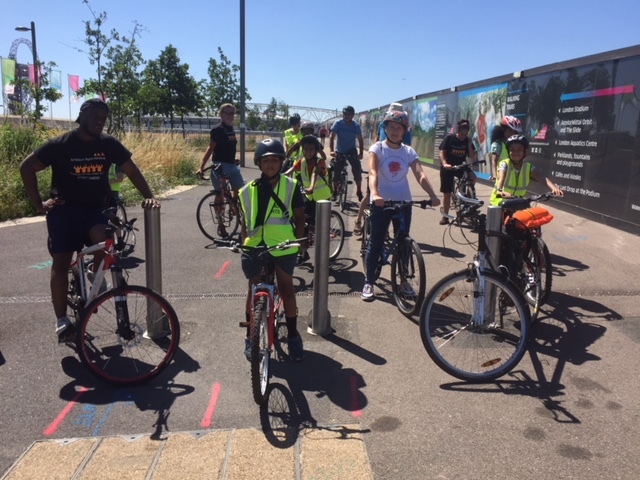 Four Newham Cyclists participated in another cycle round the Stratford works on 4 June with Michael Barratt, TfLs influential Development Development Impacts Manager and Paul Gannon, the Newham Council Officer managing the restructuring project, . By way of reminder, the Stratford Gyratory scheme has been generally welcomed by Newham Cyclists. The works already completed give a flavour of the benefits to come. One of our concerns has been to ensure cyclists remain as safe as possible during the lengthy construction works. The very positive approach by all concerned is helping to achieve this. 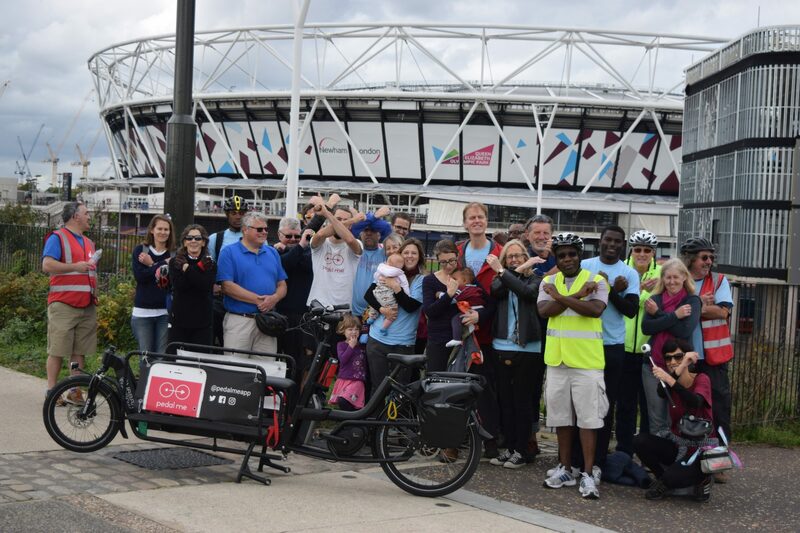 The engagement of TfL and Newham Council is very welcome. 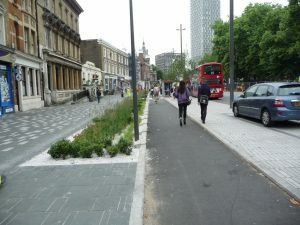 The closure of the cycle track in the Grove. However Paul indicated that this was planned to open southbound in the next few weeks. 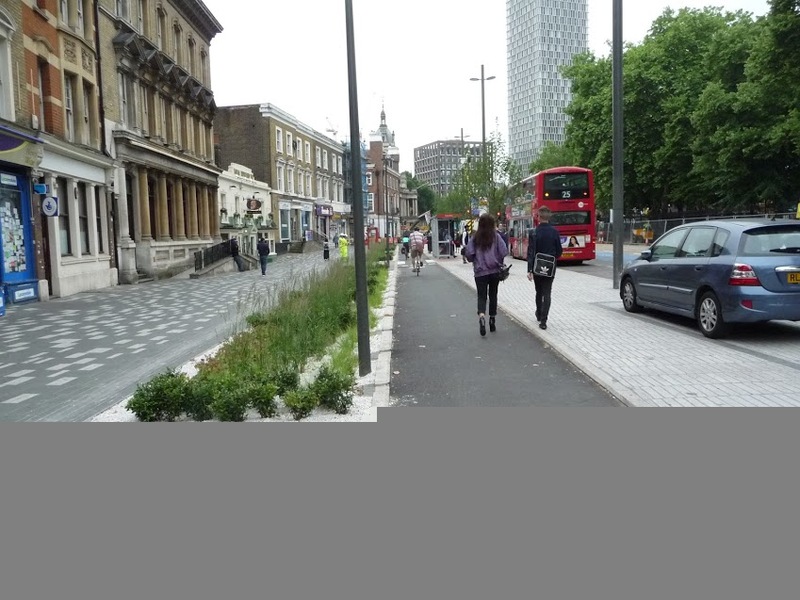 Cyclists going northbound can still use the wide shared use pavement up to Great Eastern Street. 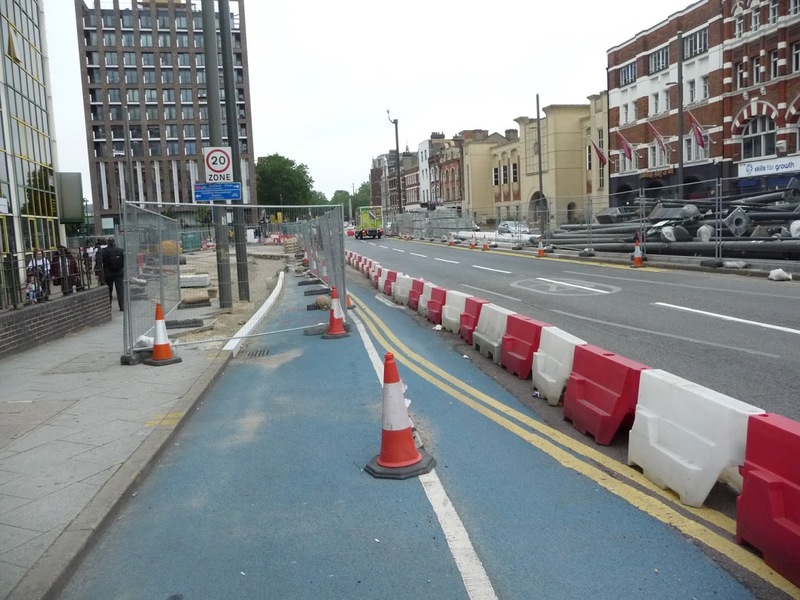 The cycle lane completed in the Broadway westbound can only be used for cyclists turning into Tramway Avenue towards Plaistow. 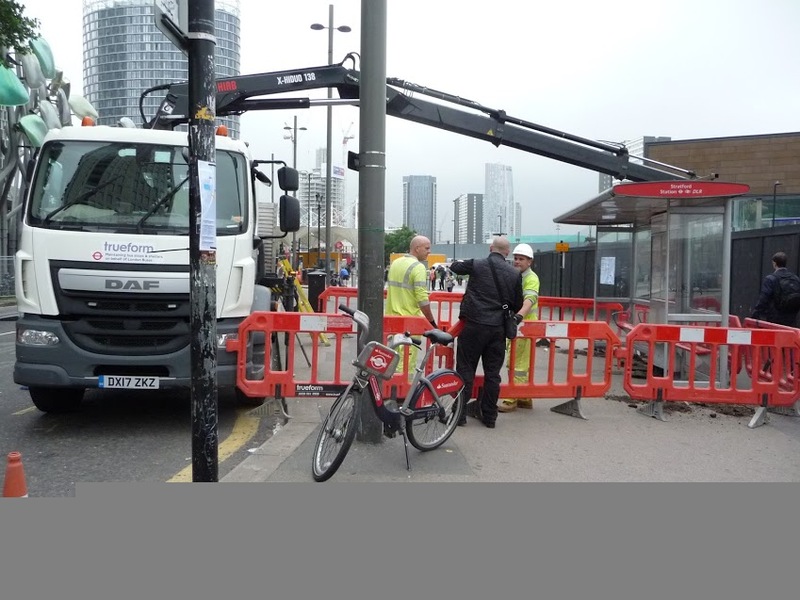 it cannot be used for continuing westbound to Stratford High St. 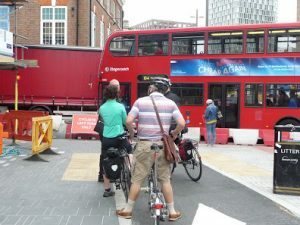 Otherwise it is necessary to move into the centre lane in order to get to the now open westbound lane outside the Old Town Hall. 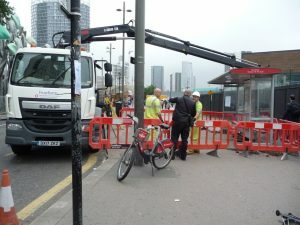 Please be aware of this if you are going westbound through Stratford to Bow in order to avoid conflict with pedestrians. Otherwise a series of minor modifications (moving fences, changing the position of signs, covering loose wires etc.) were suggested. 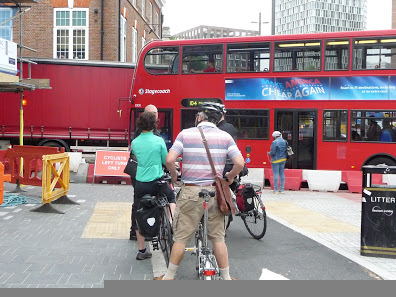 The 4m wide two way cycle track between Angel Lane and The Grove, which is currently under construction may need to be temporarily limited in width at first to prevent the idea arising that this is extra car parking space. 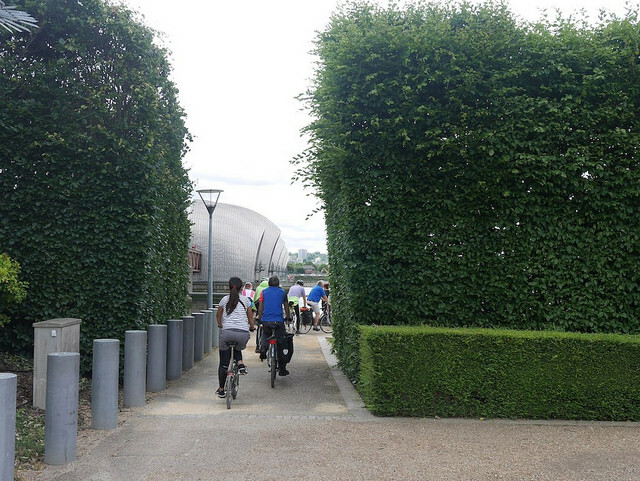 Paul is looking for the best way to do this, for example by use of planters or cycle parking. All ideas gratefully received. The track will still open with a very adequate 3m width and will move to its full 4m when bedded in. 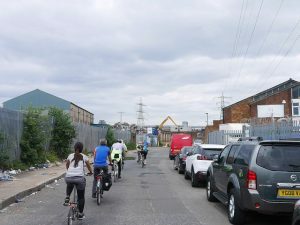 It was also interesting to learn that traffic counts had shown a significant overall decline in motor traffic (evaporation) since the works had started and a significant reduction in speeds – to nearer the 20mph limit. 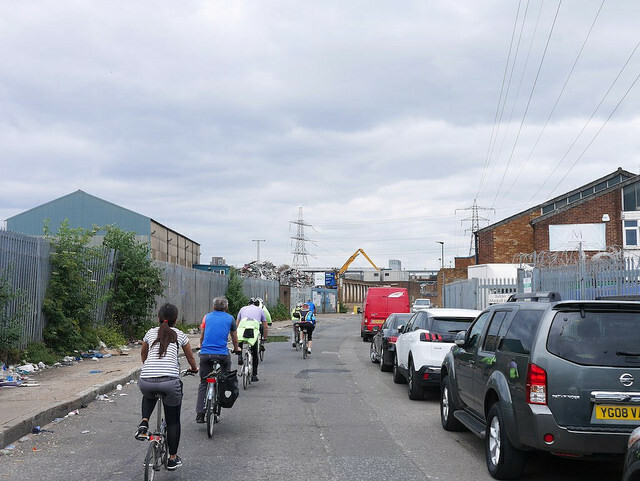 Also, further major development on Stratford High Street between Bridge Street and the Magistrates Court could present another opportunity for improvements for cycling and walking in the area. 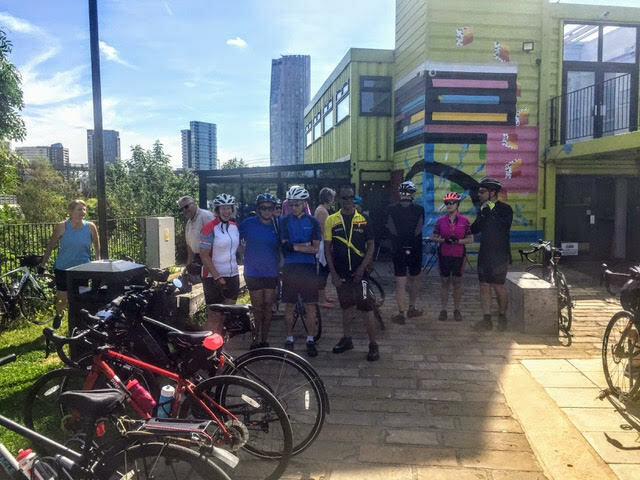 The “Over the Hill” group of cyclists from south of the river have become regular participants in our Newham rides and so they were once again tempted to cross the river and try the cake. 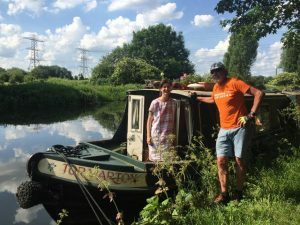 The weather was fine and warm and travelled at a leisurely pace along the canal towards Enfield lock. The first part of the ride along the canal is naturally quite flat. 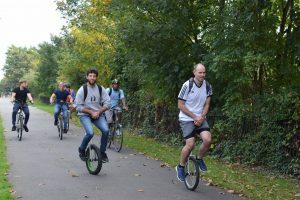 Dawes hill is always a test for heart, lungs, and the benefits of ebikes and we approached the forest this way. Riding through Chingford we stopped at the Queen Elizabeth hunting lodge, which was open, and it was easy to imagine Tudor nobles chasing deer through the valley below. 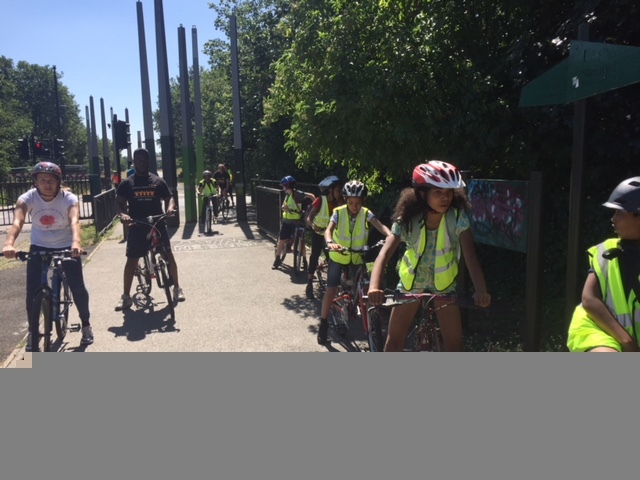 Onward to High Beech and through the forest, before negotiating the busy A121, we crossed a lesser known bridge over the M25, down a track and into Upshire and St Thomas’ church. We had lunch in the Horseshoe pub before returning to the church for tea and a mountain of cake. 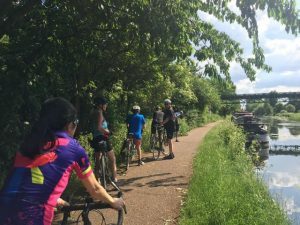 We rode back sated and probably more slowly, taking an alternative route around High Beech avoiding the hills to the the canal, which led us all the way back to our start point. 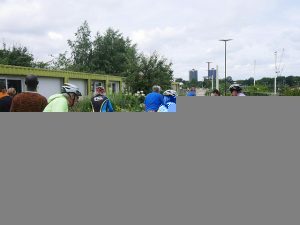 Unfortunately, as we rejoined the Greenway Roxie’s derailleur got caught in her back wheel. We we almost at the end of the ride and she was able get home and hopefully repair or replace the bike, which I believe is under guarantee. 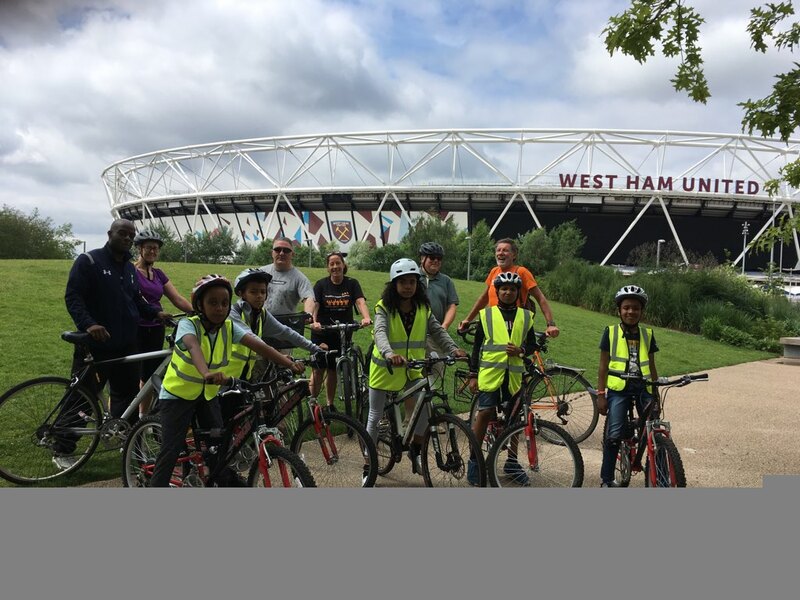 We have led two more rides for AAA’s Saturday children’s cycling club – on 5 May and 2 June. The first was a jaunt along the Greenway (first braving a traffic jam caused by a funeral in the West Ham Cemetry) and through Three Mills Green. 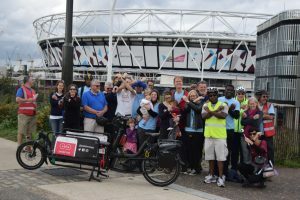 Notably we got a disability bike along the Channelsea Path linking Three Mills to the Greenway. 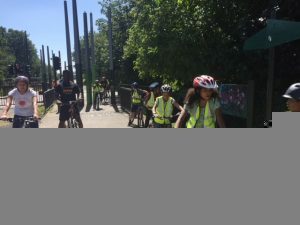 There was very positive feedback from the eight children participating. Duly inspired, and with a group of six slightly older children, our second ride ventured from the Greenway along the Lea towpath to the Olympic Park. 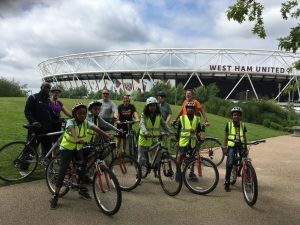 This gave us a chance to focus more on cycle skills as well as taking some of the children to a part of Newham they had not been to before or had little knowledge of. A great pleasure and success for them and us. The thaw has progressed sufficiently so this ride will go ahead. This is a leisurely ride with stops. 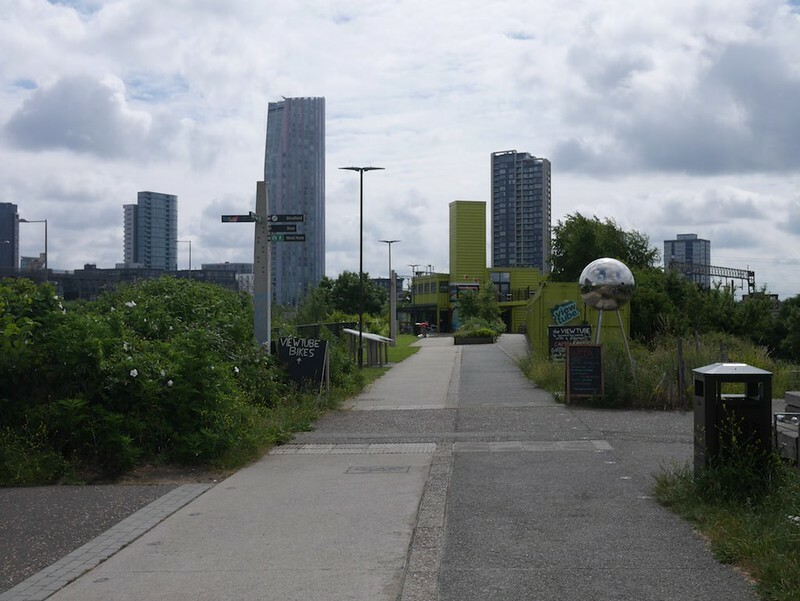 It is part of is part of Newham Heritage Week and is taking place with the assistance of Eastside Community Heritage, which has provided material, including sound clips relevant to the history of the area. Those coming on the ride are encouraged to bring a phone or tablet to give access to this document, Newham Heritage Ride Oct 2017,which provides more detail on the sights to be visited. 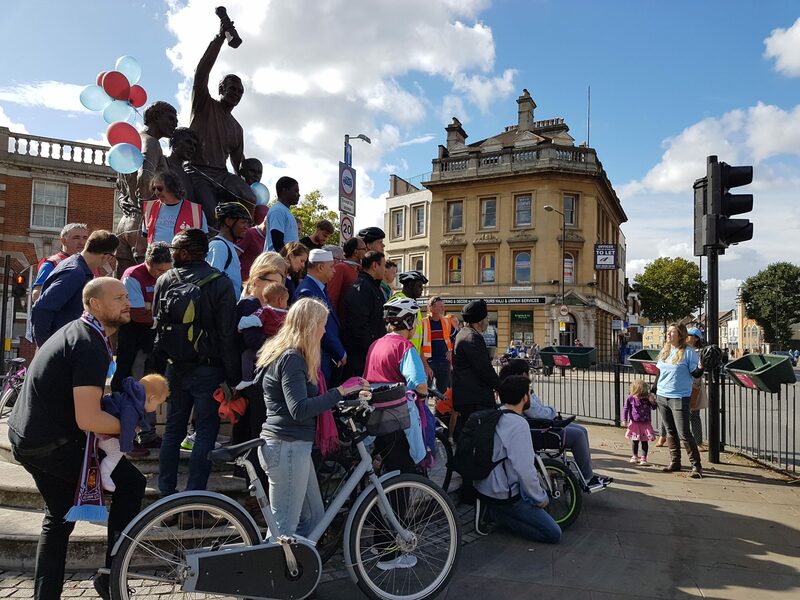 A joyous occasion, which started in glorious weather and was blessed, this time, with a win by West Ham – much appreciated by those who obtained tickets in the draw or for marshalling. 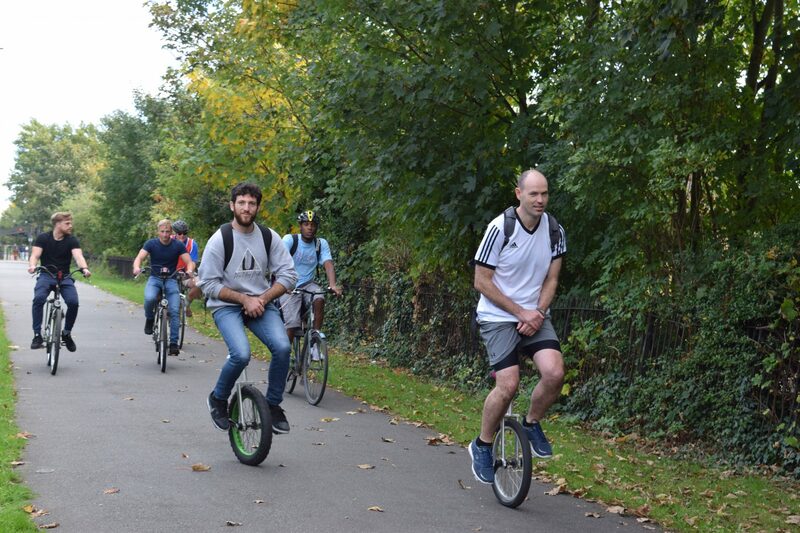 A range of bikes took advantage of the refreshed Greenway, including unicycles…. On Sunday 1 October three of us braved an adverse (but mistaken) weather forecast and were rewarded with a beautiful 40 mile ride from Epping, through the countryside of the Hertfordshire/Essex border around Harlow and back to Epping. this was new to our calendar and Steve is to be congratulated for putting it together. A particular highlight was the newly opened Henry More Foundation. Fortunately we had enough money that none of us had to resort to the free lunch in the Fox. 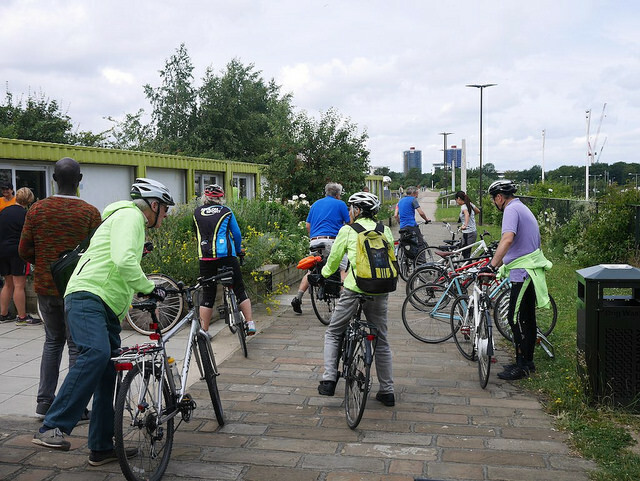 The next ride is Sunday 8 October to Rainham and Upminister. 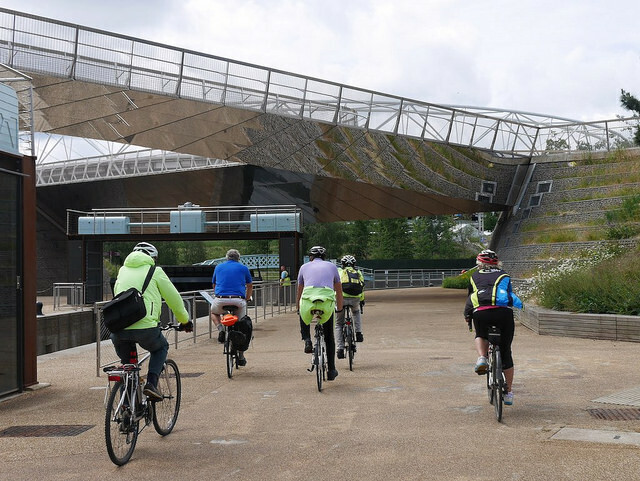 With apologies to all the ride scheduled for 25 June has been cancelled for personal reasons.